This month, OrthoBuzz asked Sheldon Lin, MD, a co-author of the May 16, 2018 Specialty Update on Foot and Ankle Surgery, to select the five most clinically compelling findings from among the 60 studies cited in the article. —A recent Level-I study1 investigated the efficacy of preemptive local anesthesia in combination with general or spinal anesthesia in 80 patients undergoing ankle arthroscopy. The authors found that patients receiving local anesthesia did not require any on-demand pain medication and reported lower pain intensity up to 24 hours post-arthroscopy. Patients in the spinal anesthesia-only group had better pain control than did patients receiving general anesthesia only. —While arthrodesis of the first metatarsophalangeal (MTP) joint is the preferred treatment for this condition among most providers, concerns over medial column lengthening and degenerative changes at adjacent joints have led to continued interest in MTP arthroplasty. In a 15-year follow-up of 52 patients randomized to MTP joint arthrodesis or arthroplasty2, Stone et al. found that those who underwent arthrodesis had less pain, fewer revisions, and greater satisfaction than those in the arthroplasty group, with equal function scores. On the basis of these data, arthrodesis remains the treatment of choice for severe hallux rigidus. —In a prospective study of 451 patients with an average follow-up of 4.5 years, Lefrancois et al. 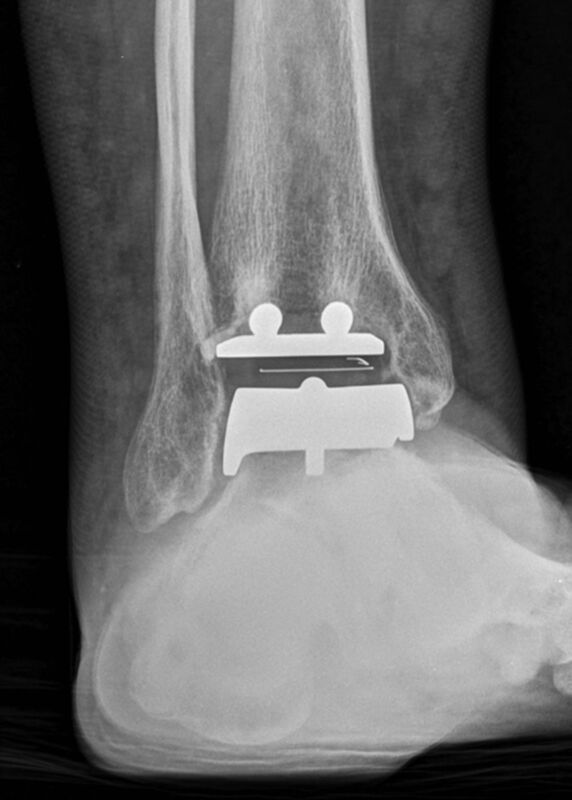 compared clinical and functional outcomes of 4 TAA prostheses: the HINTEGRA implant, the Agility implant, the Mobility implant, and the Scandinavian Total Ankle Replacement (STAR). Patients with the Mobility implant had less improvement in scores on the Ankle Osteoarthritis Scale, while the other 3 implants had comparable results. —In a matched cohort study of more than 3,000 patients examining the complication rates of TAA versus those of arthrodesis, Odum et al. found that patients undergoing arthrodesis had a 1.8-times higher risk of a major perioperative complication than those undergoing TAA. —In a randomized controlled trial of 50 patients investigating the efficacy of botulinum toxin for treating plantar fasciitis3, Ahmad et al. found that patients in the botulinum toxin group had improved function and pain scores compared with the placebo group at 6 and 12 months post-injection, as well as a lower rate of surgical treatment for recalcitrant symptoms (0% versus 12%). Liszka H, Gądek A. Preemptive local anesthesia in ankle arthroscopy. Foot Ankle Int. 2016 Dec;37(12):1326-32. Epub 2016 Sep 12. Stone OD, Ray R, Thomson CE, Gibson JNA. 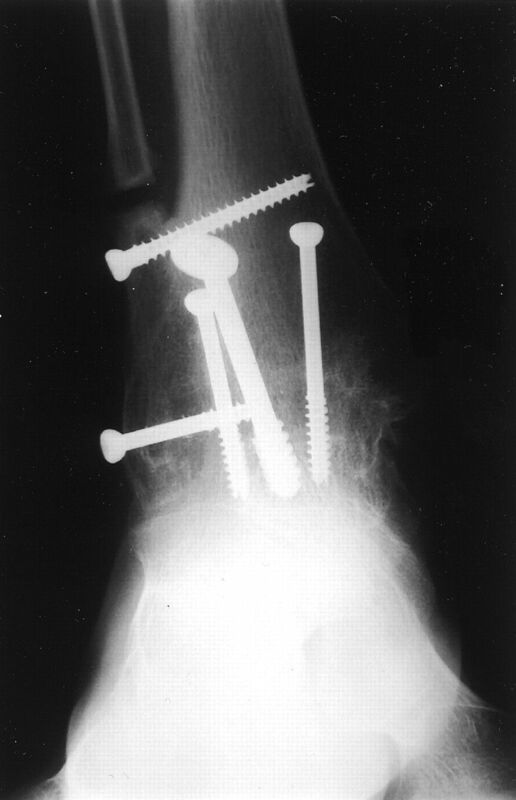 Long-term follow-up of arthrodesis vs total joint arthroplasty for hallux rigidus. Foot Ankle Int. 2017 Apr;38(4):375-80. Epub 2016 Dec 20. Ahmad J, Ahmad SH, Jones K. Treatment of plantar fasciitis with botulinum toxin. Foot Ankle Int. 2017 Jan;38(1):1-7. Epub 2016 Oct 1.